We know how hard it is to ensure you and your family are enjoying a healthy lifestyle that includes whole grains. Every Tuesday we will release a #TrainWithGrainsTip that will help you include whole grains into your healthy lifestyle. 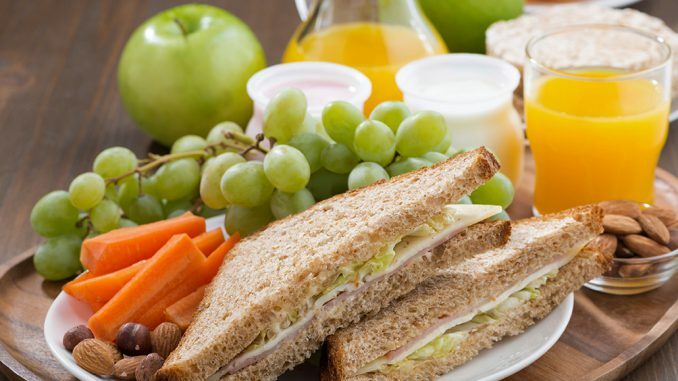 A healthy lunch includes whole grains, proteins, fruits and vegetables and a milk product. A balanced lunch includes whole grains, proteins, a few fruits, vegetables and a milk product. Think cheese and deli turkey stacked on whole wheat crackers with some local in season fruits and vegetables! If you already have it on hand, its easy to make a healthy lunch. Don’t forget to stock up on whole grains like breads, wraps and crackers ahead of time to quickly make those lunches! Stock your freezer with easy defrost items like sliced fruits, and quick to cook vegetables or these Nut Free Soy Energy Bites! Organize a snack drawer with non-perishables like; trail mix, soy nuts, raisins and whole grain cereals that can be grabbed in a hurry. Have a go-to lunch that can be quickly made by all ages. Think ham and cheese on a whole wheat pita and an apple with soy butter!